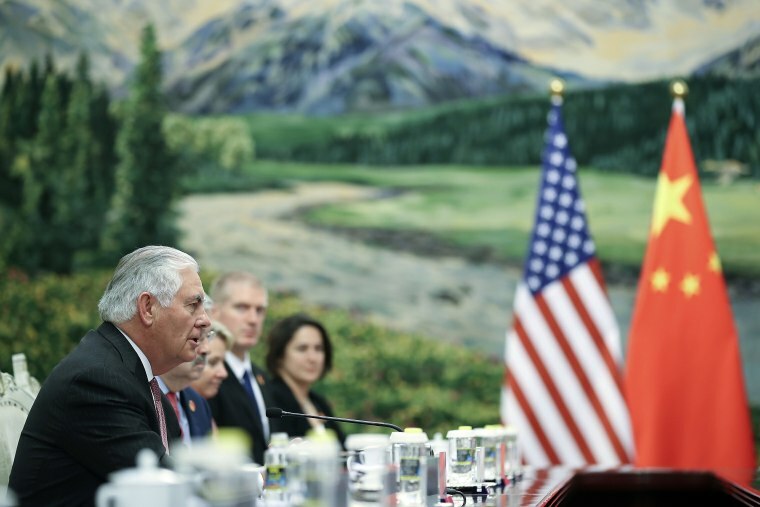 BEIJING, China — The United States has direct channels of communication with North Korea, Secretary of State Rex Tillerson said Saturday, adding that Washington was "probing" for potential dialogue with Pyongyang. “We are probing, so stay tuned,” Tillerson told reporters during a trip to China. On Saturday, State Department spokesperson Heather Nauert confirmed the attempts at contact. "U.S. diplomats have several open channels in which we can communicate with officials within the North Korean regime,” she said in a statement posted on Twitter. “Despite assurances that the United States is not interested in promoting the collapse of the current regime, pursuing regime change, accelerating reunification of the peninsula or mobilizing forces north of the DMZ, North Korean officials have shown no indication that they are interested in or are ready for talks regarding denuclearization,” Nauert wrote. Tillerson was holding a series of high-level talks as the United States looks to tighten an economic squeeze on the rogue nation, hoping to force the regime to retreat from its nuclear arms and missile programs. The Secretary of State was also laying the groundwork for President Donald Trump's forthcoming visit to the country which is scheduled for November. The United States sees China as critical to averting a military confrontation with Pyongyang, which is fast advancing toward its goal of developing a nuclear-tipped missile capable of reaching the United States. U.S. officials, speaking on condition of anonymity, say they believe China's priority is stability on the Korean peninsula, since a political collapse would almost certainly push destabilizing waves of refugees into northeastern China. China has said it will strictly and fully enforce U.N. resolutions against North Korea and its Commerce Ministry on Thursday said North Korean firms in China and joint ventures in China and overseas would be shut down by January, in line with the latest UN resolution. U.S. officials said Beijing appears increasingly willing to cut ties to North Korea's economy by adopting U.N. sanctions, after long accounting for some 90 percent of its neighbor's foreign trade. Trump has called on the country to do more on North Korea and has promised to take steps to rebalance a trade relationship that his administration says puts U.S. businesses at a disadvantage. Tillerson, whose arrival in Beijing was delayed due to mechanical problems with his aircraft, told Chinese Foreign Minister Wang Yi that Trump was looking forward to his China visit.